Last Wednesday night at the Regency Theater in Westlake Village, CA I got to watch the film, Vaxxed: From Coverup to Catastrophe, for the first time. As an individual passionate about health and wellbeing, I as blown away. I have researched and read countless books, articles, and documentaries about vaccines since my time in Chiropractic school and still I came away with so much more knowledge and, honestly, disgust for the pharmaceutical and health agencies. As a Chiropractor, I have never felt so strong about my position in my community and the necessity of Chiropractic for the betterment of our children, our families, and our communities’ health future. Here are a couple of my take-aways from this film. There is so much to say. I could write a whole book on my thoughts from the film, vaccines, and health in general, but we’re going to keep it focused for everyone reading. This isn’t a debate. This isn’t a scientific journal discussing all the facts. This is simply my first thoughts that I had after watching the film! I have seen most, if not all, the vaccine documentaries such as The Greater Good, Bought, and Trace Amounts. I feel that documentaries are going to be the gateway into raising awareness on this important issue because many people simply aren’t going to pick up and buy a book they’re not completely certain they’ll agree with to begin with. There is simply too much information to get across that a book doesn’t always do the best job for a newcomer. Vaxxed does a brilliant job of addressing a deeper issue that affects everyone, including those who are pro-vaccination. It addresses the fact that we have been LIED TO and that the doctors, the experts who families have trusted for generations, have been lied to as well. It’s my opinion that many documentaries go about it from a scientific stand point, often trying to attack the vaccines themselves. While it’s a valiant effort, the problem still remains that there is cultural authority for this term called “evidence-based.” The problems with the “evidence” in this case is 1) the “evidence” is being conducted by the same organization that stands to profit from the vaccines and 2) there is evidence (thanks to a whistleblower within the CDC itself) that data may have been falsified. How can we base our decision on evidence that may be corrupt? Vaxxed addresses these evidence issues. This film is set up like a court case. The case is NOT to address the efficacy of vaccines, but to address the corruption within the organizations who stand to profit from the vaccines and who also happen to control the safety regulations and studies done on vaccines. The case in this documentary is a question of whether the CDC has committed fraud or not. Has the CDC deliberately destroyed documents and falsified data to cover up a significant problem with the MMR vaccine? The filmmakers lay out the terms within our judicial system that would substantiate a case for fraud and take the viewer step by step through the case uncovering fraudulent claims, obstruction of justice, and more. The end conclusion doesn’t deliberately scream out “Don’t Vaccinate Your Child!,” but calls for further investigation on the CDC because of the evidence presented. The goal isn’t to make your decision for you but to show that there is some serious corruption in the iron throne of our CDC. If these claims are true that the CDC did cover up information about vaccines and studies done, this SHOULD make you furious. The evidence and facts that arise during this documentary are absolutely mind-blowing and should truly resonate with you to look into this issue further. If you are basing your decision off of falsified information, wouldn’t you want to know? As a Chiropractor who sees whole families and children with neuro-developmental challenges, I have heard many of the stories from our parents, but to actually witness and visually see what some of these parents went through immediately following the injuries and throughout their lives was truly heart-wrenching. I am beyond impressed with all our parents in our office. You all are rockstars. It’s one thing to read about the science, the data, the facts, the theories, and the conspiracies, but when you see videos of children growing up smiling and perfectly healthy and witness video footage following a vaccination where the child slowly starts to regress from walking to crawling to banging their head, it is hard to watch and not make the connection. We see a lot of babies in our practice. Not because they have back pain or neck pain, but because they have a nervous system that needs to be maintained in order to ensure an optimal brain-body connection for 100% health. Adjustments are extremely gentle with no clicking or popping (for those who are wondering) and uses the same pressure I would use to check a tomato for ripeness. There’s a video of a little baby girl having a terrible seizure while mom tries to comfort her… I’m not a father yet, but as a doctor for many babies whose parents have trusted me with their little girl’s or boy’s health, I cannot imagine the weight and the pain of watching your own child go through that, nor do I ever want to. The stories are powerful, whether you have children or not. When watching the before and after videos, you cannot help but be thinking what everyone else is thinking. What was fascinating to me was the audience. 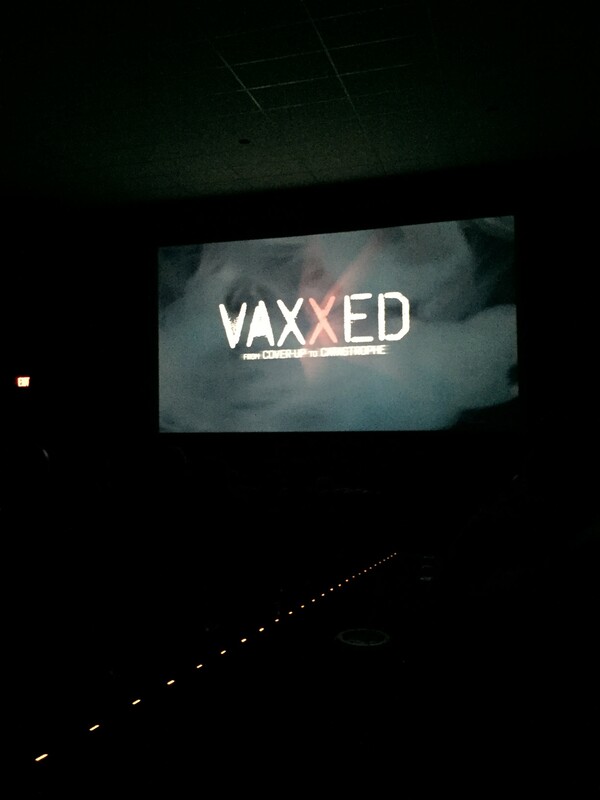 You’d think that a documentary about vaccines and fraud would draw a strong crowd from mostly people who have experienced a child or family member being injured by vaccinations, but that was not the case. The truth is only 25% of the crowd fit that category. I think it’s incredible to see so many people become more aware and interested in this topic. I believe it is going to be so beneficial for the health of our children that people are starting to hold the healthcare system more accountable and are starting to take responsibility to do their due diligence before going forward with any decision on what to put in their bodies. The reality is we have lived in a world for so long where Medical Doctors have always been right and there is no need to do our research. Let the experts take care of it, and we don’t have to think about it. Vaxxed exposes the reality that these experts that we’ve looked to for answers have been lied to. It’s not their fault, but now the system is slowly collapsing, and honestly it needs to! We need to hold our system accountable. 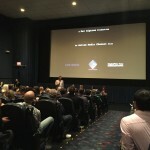 During the Q&A, we listened to countless stories of people affected and frustrated by the situation we are in. Parent after parent came forward to share their story, and it really wasn’t so much of a Q&A as it was almost venting! You could feel in the air how needed this film was because all of these people just needed a voice. I’m very thankful this documentary has been receiving so much recognition in the world, but it truly needs so much more. The quality of the film is incredible and is a perfect entry point for those who want just a taste of what is going on in the vaccine industry without getting loaded down with all the science. I love that I get to help families and children build health from within. I love growing our wall of testimonies and helping as many people as possible. One thing that I realized after watching this film is that my office will be desperately needed with the new vaccine law in effect. There will likely be many more cases that walk through my doors due to these injuries. I desperately wish that was not the case. It saddens me every time, but I feel blessed to be able to be a part of many families’ healing afterwards. We get to see amazing things happen everyday, whether it’s the little everyday things that we can help or sometimes the bigger miracles. I’ve realized that for many families the small things are big things to them, and that’s all that matters me. I strongly urge you to see this movie. If you don’t like it, you’ll be out a couple bucks and an hour and a half of your time. Once the video is available for purchase we will be holding private showings of the film for our community. So make sure you stay connected so we can spread the word.